Free Shipping Included! Save 1% on the Klipsch Surround Dolby Atmos Bookshelf Home Speaker Set of 2, Black Vinyl (R-14SA) by Klipsch at The Met Theatre. MPN: R-14SA. Hurry! Limited time offer. Offer valid only while supplies last. R-14SATAKE YOUR MOVIES AND MUSIC TO NEW HEIGHTS, The R-14SA Dolby Atmos enabled elevation speaker is a fantastic complement to our Reference family. R-14SATAKE YOUR MOVIES AND MUSIC TO NEW HEIGHTS, The R-14SA Dolby Atmos enabled elevation speaker is a fantastic complement to our Reference family. 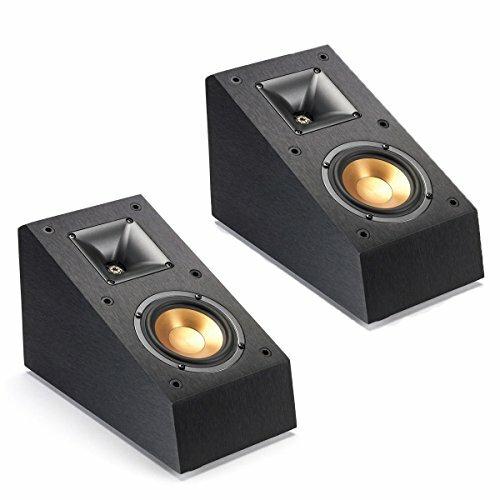 Set this height channel on top of your existing floor standing speaker to complete a hemisphere of rich, detailed sound. Your music and movies will never sound the same.